Windows OS Hub / Windows Server 2012 R2 / How to See Number of Active User Sessions on IIS site? How to See Number of Active User Sessions on IIS site? 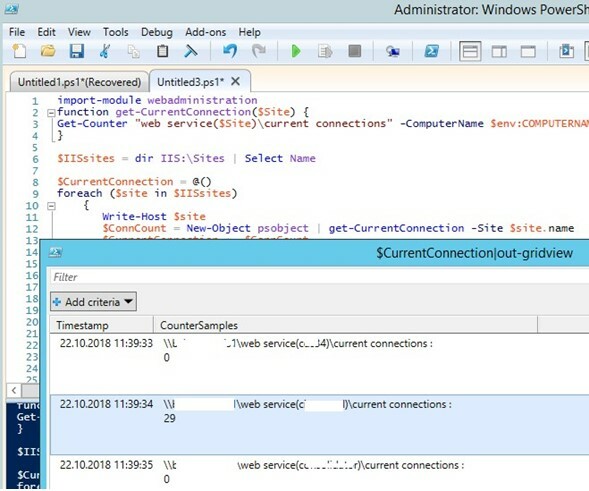 How to quickly estimate the current number of user connections (sessions) to the IIS sites on webserver running on Windows Server? Such information will allow to determine and predict the load on the server, choose the best time for the maintenance and updates of the website, predict the IIS server’s load when the number of users increases. 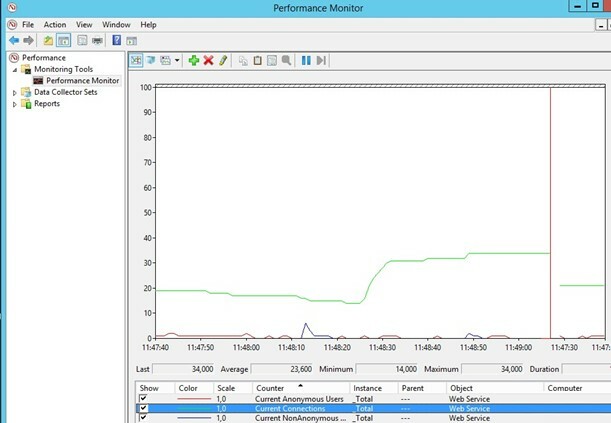 The easiest way to determine the number of active user sessions on the IIS Web site is to use the performance counters in Windows Performance Monitor. 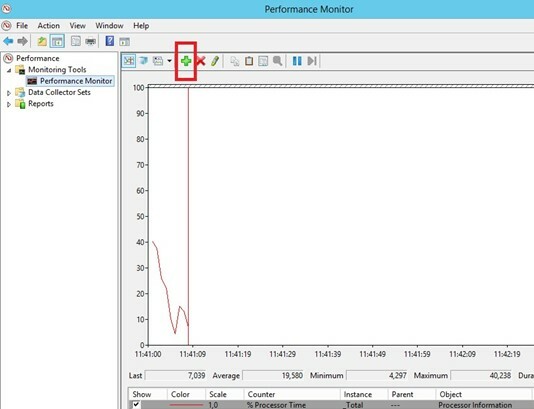 Open the Performance Monitor console by running the perfmon command and go the Performance monitor section (Monitoring Tools — > Performance Monitor). Then you need to add the necessary counters to the monitor window (by default, the total CPU usage counter is displayed, but you can remove it). To add a new counter, click the green button on the toolbar (you can see it on the screenshot) or press Ctrl+N on the keyboard. Current Connections – total number of active connections on the IIS server. 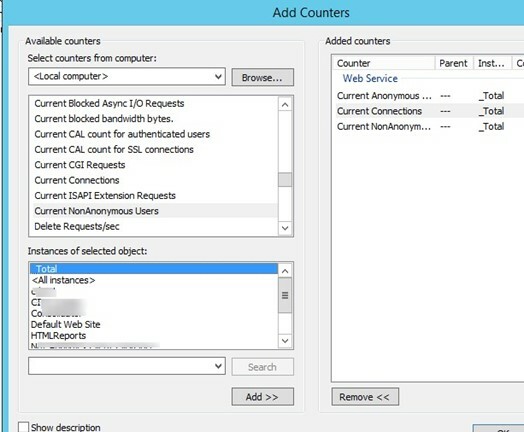 Select the desired counter and in the Instances of selected objects choose one or more IIS websites for which you want to display connection information. The information about users of all websites on the server is stored in the _Total instance. Now you only have to click the Add >> button to move the counter to the list of the counters to be added in the right pane. Add all the necessary counters in the same way and click OK.
Now the information about the number of user sessions in the Performance Manager console is being displayed in the real time (by default, the counter values are displayed as linear graphs). If you select any of the counters in the bottom pane, you can view its last, average, minimum or maximum value for a given period of time. You can add custom performance counters to this console and save them in a separate view, which can be used later to quickly access the web server load data. 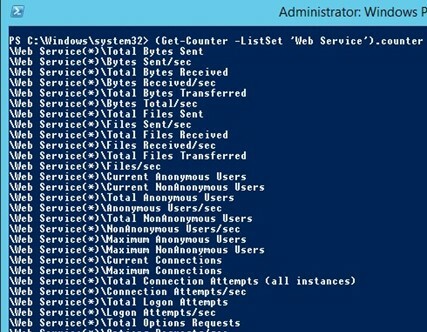 As you can see, this command returned both the total number of connections to the IIS server and the statistics for each of the sites. With the –Continuous option, the information about the value of the counter is constantly displayed in the console until you’ll interrupt it using CTRL+C. Check the value of the current connections counter and make sure that it increases. You can display information about the amount of received/sent data for each site or the entire web server using the Web service(sitename)\Bytes Received/sec and Web service(sitename)\Bytes Sent/sec counters. So, we looked at a way to get information about the load on sites running on the IIS web server. How to Import and Export Mailbox to PST in Exchange 2016/2013/2010? 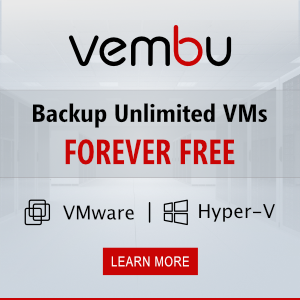 How to Run Program without Admin Privileges and to Bypass UAC Prompt?